My choice in a snowshoe was made after a lot of research. The snowshoe that I chose has performed even better than I anticipated. I had certain requirements that I needed in a snowshoe and you should decide what you need, too. The main requirement was that the snowshoe had to be versatile enough to take me wherever I might want to go: rugged climbs or just an easy walk through the woods. The following describes some of the features of the MSR Ascent Snowshoe that I selected. The numbers on the snowshoe image on the right refers to the features listed below. The nonstick deck is made with a one-piece injection-molded deck that sheds both snow and ice. The deck is unusually small (8" x 22"). When walking, you have no indication that you even have snowshoes on. The snowshoe is relatively lightweight. The deck is extremely durable in resisting scratches or nicks. Some people feel that a molded snowshoe makes more noise on hard packed snow or ice than a traditional snowshoe, but that has never been an issue for me. The serrated edges run the length of the shoe on both sides and grip the snow for unmatched traction while traversing. The serrated edges and the crampons are designed primarily to resist backsliding on steep terrain. I have climbed up and down steep slopes in both powder and ice and the snowshoe performed extremely well. The steel spikes add additional gripping ability in hard pack or icy conditions. The binding includes 3 straps over the front of the boot and 1 strap in back of the boot. The straps are easily locked while wearing mittens which is an important feature. 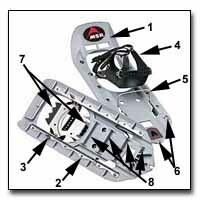 The straps lock the snowshoe securely with the boot. The straps are very flexible in low temperatures and resist snow buildup. To prevent cutting off circulation on your feet, you can use the straps with light tension and they perform fine. The bindings support from small to large boot sizes. When needed, they support the heel to reduce calf fatigue on steep slopes. The bars flip up easily when needed to raise the heel of the boot above the snowshoe. 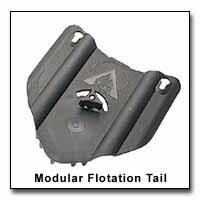 They are easy to use and can be raised while wearing mittens by raising a little black tab on the heel lifter. 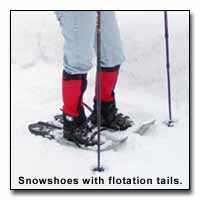 Modular 4" and 8" flotation tails convert the snowshoes into three different type of snowshoes, thus eliminating the need for multiple pairs of snowshoes. The flotation tails are easy to slide on to the back with mittens on and are held into place with one quick turn of a knob. This allows you the flexibility of using a 23" snowshoe most of the time until real deep powder necessitates adding a flotation tail. The hardened steel crampons with four aggressive front teeth and three rear teeth offer unrivaled traction whether in powder or black ice. They move each time when the foot is lifted to tightly grip the snow or ice. The quad-point braking bars work in conjunction with the steel crampons to stop you in your tracks if you happen to start sliding backward or forward. Whatever snowshoe you decide to purchase, decide on what you will be using the snowshoe for. If any of the above features are important to you, make sure that your choice of snowshoe has those features. 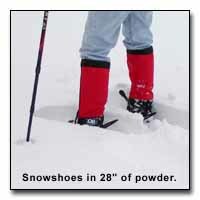 Whatever snowshoe you choose, keep in mind that you will also need poles. Choosing the correct snowshoe for you will open up more opportunities in experiencing nature.